In Altavilla Vicentina, Italy, a Clever Sleever Machine places and shrink-wraps decorative sleeves on bottles at a rate of 18000 pieces per hour. That’s five pieces per second. So, imagine how much money would be lost every time they have to stop production to replace a damaged or broken slip ring. That was the problem facing Clever Machines. Clever provides a wide variety of sleever machines and heat-shrink tunnel applicators. These machines can perform every type of sleeve application required by the client, at different production speeds, including linear and rotary machines suitable to apply full and partial sleeves and safety seals. These machines can be found in many different packaging applications including food and beverage, cosmetics and pharmaceuticals. “Through constant technological research, in conjunction with our clients, we are committed to finding solutions to our clients’ needs,” said Tagliaferro Silverio, owner of Clever Machines. So, when a client came to them with the need to reduce downtime on their Sleever Machine because of the time-consuming nature of maintaining slip rings, Clever contacted Rockwell Automation. Rockwell suggested they use ProSoft Technology’s 802.11n Fast Roaming Industrial Hotspot radios and a 5 GHz radiating cable as the antenna. The 802.11n Fast Roaming Hotspot supports Access Point, Repeater, Bridging and Client modes and delivers fast data rates up to 300 Mbps. 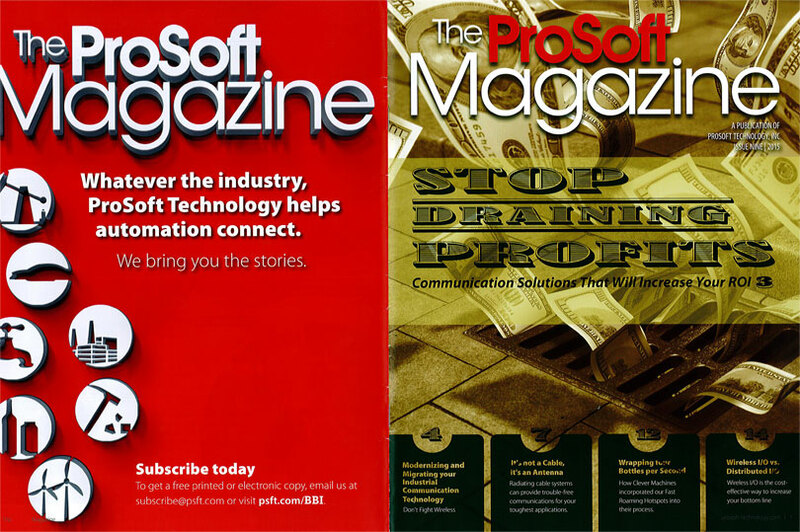 “The Fast Roaming feature of this radio maintains seamless, high-speed connections particularly well-suited for moving equipment like Clever’s Sleever Machine,” said Andrea Mazzucchelli, Regional Sales Manager for ProSoft Technology. “This was the excellent packet-per-second performance and robust communications we were looking for,” said Andrea Parlato, Electrical Division Technical Manager for Clever. 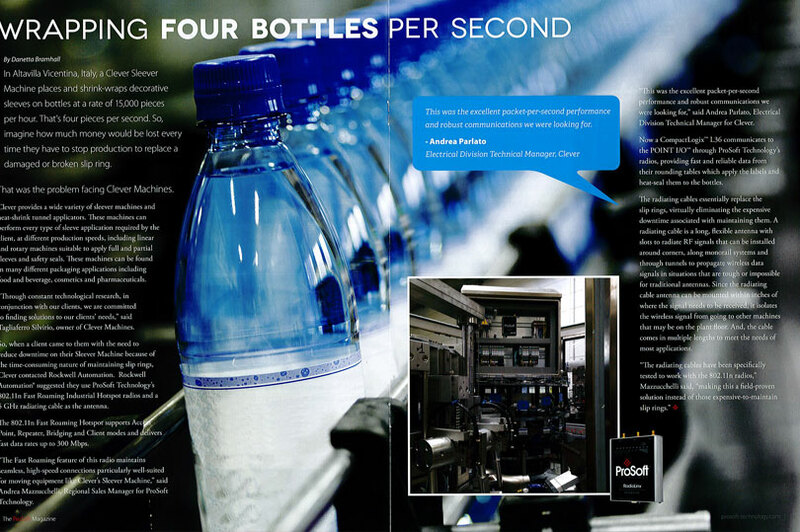 Now a CompactLogix™ L36, communicates to the Point I/O through ProSoft Technology’s radios, providing fast and reliable data from their rounding tables which apply the label and heat-seal them to the bottles. The radiating cables essentially replace the slip rings, virtually eliminating the expensive downtime associated with maintaining them. A radiating cable is a long, flexible antenna with slots to radiate RF signals that can be installed around corners, along monorail systems and through tunnels to propagate wireless data signals in situations that are tough or impossible for traditional antennas. Since the radiating cable antenna can be mounted within inches of where the signal needs to be received, it isolates the wireless signal from going to other machines that may be on the plant floor. And, the cable comes in multiple lengths to meet the needs of most applications.